Coins are not my favorite transaction items. But when you get a lot of them, it’s always clever to have a separated coin purse in your bag. Or am I giving myself reasons to purchase this beautiful thing? Well, it doesn’t matter. Take a close look at the Boy Chanel Small Coin Purse; the Boy is always a good investment. But imagine that you now have this reliable Coin Purse in your bag, accepting coins will never be boring again. It’s fun, because everything you pull it out to pay or store coins, all the eyes will be pointing at you. While it’s small and functional as a Coin Purse, the interior is separated in several parts. The exterior features the Boy Clasp in Ruthenium Metal and Diamond Quilting. Can you say ‘no’ to it? Have you noticed? There are plenty of Boy Chanel Wallets and Boy Chanel ‘Large’ Pouches available at the boutiques. But can you find the right Boy Chanel Pouch in Small Size? Well, here is one that makes you obsessive. If you’re not planning to shop and spree until next year, don’t read further. This is indeed a super-cute little pouch – beautifully quilted in soft lambskin leather, luxurious and refined with the boy elements like the top horizontal lines and the iconic boy clasp. The combination of the colors fuchsia with golden hardware is just perfect. The pouch is made with a top zipper, open it to store your personal essentials like cosmetics. The Boy Chanel Quilted Small Pouch can be used as a make-up box, but it could also be your evening companion, like a clutch-partner, always on your side to help you flaunt. Oh boy, oh boy, oh boy, here we go again. A splendid bag, invented not so long ago, but the new ‘Boy’ version is completely new. Before we dive deeper, we want to give you some more information about the style, like always. You see, this style was also released in the previous collection, the Chanel Fall Winter 2016 Act 1. The previous version looked more like the Classic Quilted WOC – it featured a nice cc logo, and the same super-soft quilting crafted in lambskin. This latest version is a new addition to the Boy Collection, it’s made with straight-line on the edges and the iconic Boy Logo on the front. This bag opens with a zipper; inside you can find a large compartment. 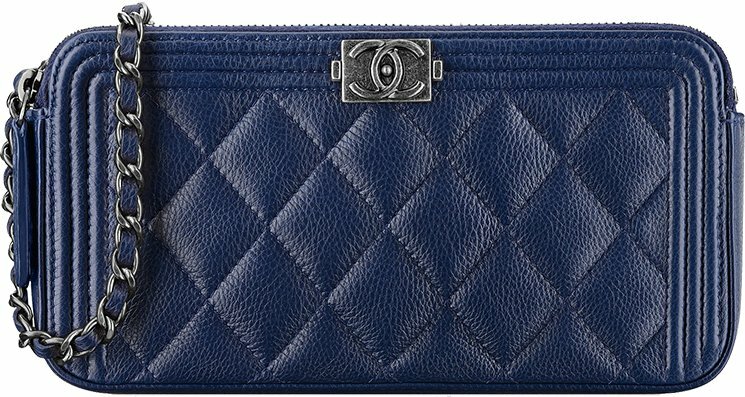 We belief the interior of the WOC is more structured than the Boy Chanel Small Quilted clutch with Chain. Style code: A84069, measuring 3.6′ x 7.1′ x 1.2′ inches, priced at $1500 USD, €1300 euro, $10900 HKD, $2100 AUD, $2070 SGD, ¥171720 JPY via Chanel boutiques.